Ukraine's President Petro Poroshenko finally announced that he will seek reelection at a packed forum on January 29 in Kyiv. Poroshenko got specific and addressed weaknesses in other candidate's platforms. Ukraine faces a populist threat, he claimed, and the country would end up like Venezuela under a populist. With images of poor Venezuelans cueing for butter and basic groceries on the frontpage of every international newspaper, the line stuck. Plus, a populist would be a win for Russian President Vladimir Putin. He hinted that his major rival Yulia Tymoshenko closed an unfavorable gas deal with Russia in 2009. He also claimed that her plan to change the constitution would make Ukraine a dictatorship. He also hinted that comedian and presidential contender Volodymyr Zelenskyi's proposal on how to deal with the Kremlin is naive. During the forum, Poroshenko and his supporters presented him as the national savior in the face of Russian aggression who made the impossible, bringing Ukraine closer to the EU and NATO, possible. He claimed that he is the only one who can continue this path and make Ukraine a full member of these organizations. Even the name of the forum pointed to his European aspirations, "From Kruty to Brussels. We follow our own path," and the EU flag was part of the forum's logo. 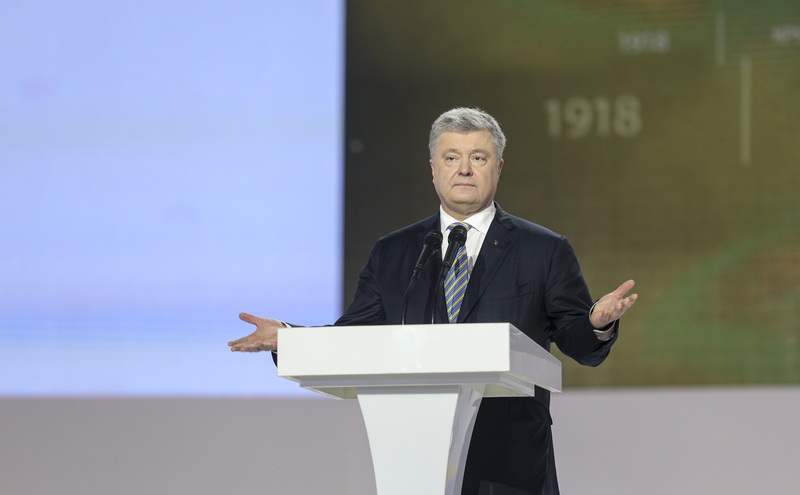 Poroshenko tried to present himself as the president of all people. He was nominated by society at the forum, not his political party, since his public support has declined since 2014. At the same time, his emphasis on NATO and EU seems to be tailored for voters mainly in western and central Ukraine, since polls show more than 50 percent of eastern Ukraine would vote against EU membership and about 70 percent against NATO. The president didn't neglect the youth vote. One featured video included young people talking about Ukraine's future. More than fifty young people sat behind him on stage, which was a strong visual. He also invited rapper Alyona Alyona, who later fled when she found out that the forum was a political event and not a charity event as she says she was told. Moreover, the forum's name was devised for young patriots defending Ukraine in the Donbas. The hall was full of influential people from the cultural sphere—film directors, publishers, actors, musicians—to support the incumbent. Among them, Les Podervianskyi, a Ukrainian artist and playwright, said that Ukraine would be a mess without Poroshenko. Representatives of agriculture, IT, and science went on stage to boost Poroshenko's candidacy. There were also famous foreign guests. For instance, Anders Fogh Rasmussen, ex-NATO Secretary General and current adviser to Poroshenko, made an appearance on Tymoshenko's congress through video, but he attended Poroshenko's forum in person. Two other powerbrokers were absent. Interior Minister Arsen Avakov and former Prime Minister Arseniy Yatsenyuk, both from the People's Front and part of the governing coalition, didn't show up. They have many disputes with Poroshenko. With high negatives and less than ten weeks remaining until the first round of the election, Poroshenko's only chance is to rally his base and pray that he makes the second round. He will likely face former Prime Minister Yulia Tymoshenko in the second round, which means a showdown between Poroshenko's "Euro-Atlantic course" and Tymoshenko's "new course." This story was prepared with the financial support of the International Renaissance Foundation.